"Don't judge a bull by its cover." 20th Century Fox and Blue Sky Studios have debuted yet another trailer, the third official trailer, for the animated film Ferdinand, about a bull raised by a family in Spain and taken to be a fighter, who really prefers to smell flowers instead of battle against matadors. This trailer is all about the cast and the announcement that Nick Jonas has recorded a song for the film. John Cena voices Ferdinand the bull, which might be one of the best voice choices all year. The rest of the voice cast includes Kate McKinnon, Gina Rodriguez, Daveed Diggs, Gabriel Iglesias, Bobby Cannavale, David Tennant, Anthony Anderson, Flula Borg, Jerrod Carmichael, Boris Kodjoe, and Raúl Esparza. This does look quite charming and most of all, it seems to have an important message we can all learn from. You can also still watch the first teaser trailer for Blue Sky's Ferdinand here, or the second trailer here. Ferdinand tells the story of a giant bull with a big heart. After being mistaken for a dangerous beast, he is captured and torn from his home. Determined to return to his family, he rallies a misfit team on the ultimate adventure. 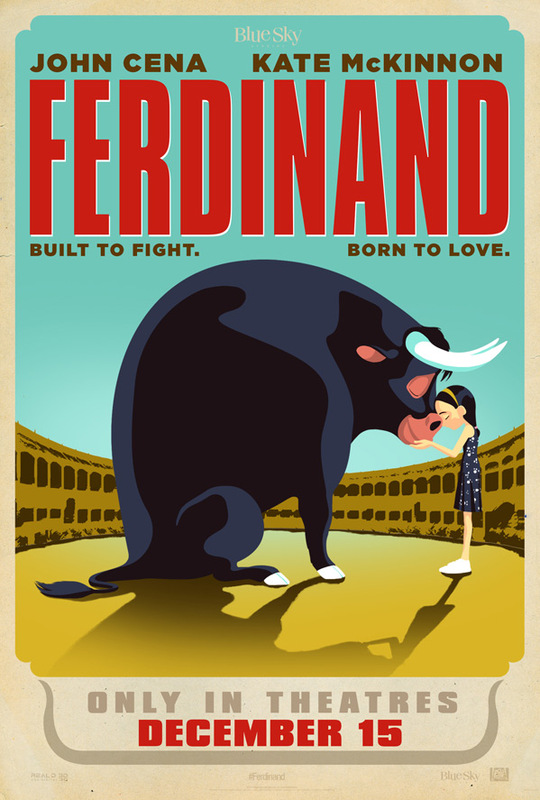 Set in Spain, Ferdinand proves you can’t judge a bull by its cover. Ferdinand is directed by Brazilian filmmaker Carlos Saldanha, co-director of Ice Age, Robots, and director of Ice Age 2, Ice Age 3, Rio, and Rio 2 previously. The screenplay credit is undetermined; it's based on Munro Leaf's book of the same name. 20th Century Fox will release Blue Sky Studios' Ferdinand in theaters everywhere starting December 15th later this winter. For more info, visit the official site. Planning to see this movie?